The definitive treatment for DCS is hyperbaric oxygen (HBO) therapy, or the delivery of pure oxygen at a pressure substantially higher than that of atmospheric pressure. HBO therapy reduces the size of any bubbles and improves gradients which promote oxygen delivery and inert gas elimination. 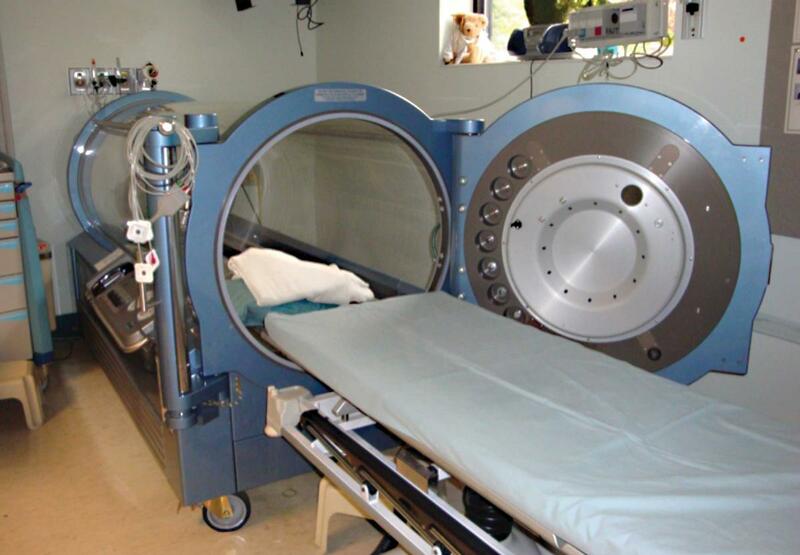 HBO therapy is typically delivered in recompression chambers. 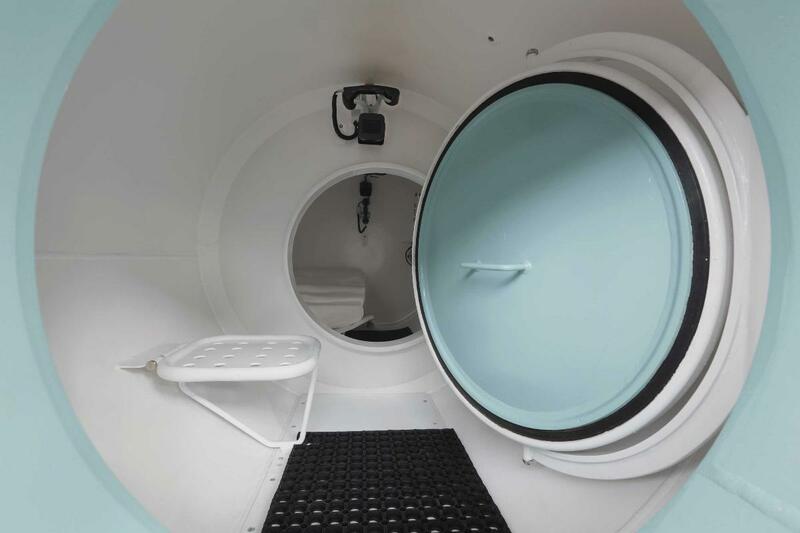 This is a small multiplace and multilock hyperbaric chamber; it can hold multiple patients plus inside tenders. Personnel or equipment can be transferred into or out of the chamber while treatment is ongoing. 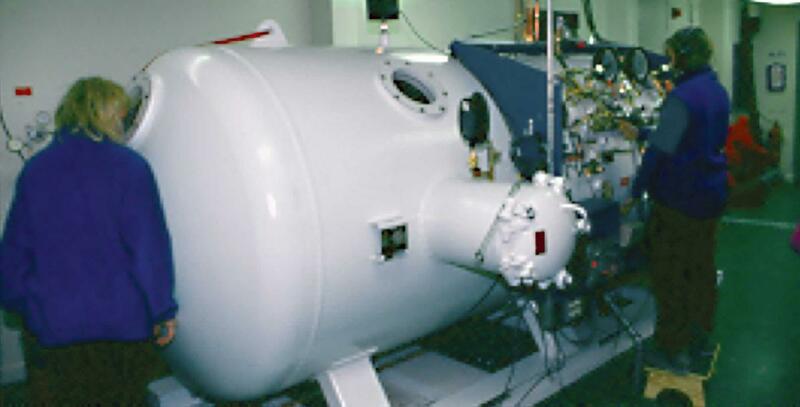 the hyperbaric chamber is initially pressurized to 2.8 atmospheres absolute (ATA), equivalent to the pressure found at 60 feet (18 meters) of seawater. The patient breathes pure oxygen, interspersed with scheduled periods of breathing regular air to reduce the risk of oxygen toxicity. The usual duration of the USN TT6 treatment is just under five hours, but extensions can be added as required, based on the patient's response. HBO treatment can be conducted in a monoplace chamber, often an acrylic tube sized to hold just one patient, or in a multiplace chamber, sized to accommodate one or more patients plus one or more "tenders" — that is, technicians or other medical personnel. Multilock chambers are designed to allow patients, tenders or equipment to be transferred into and out of the chamber while treatment is ongoing. This is a large multiplace and multilock hyperbaric chamber, in which multiple pressure exposures can be conducted simultaneously. The course of HBO therapy will vary according to the particulars of each case; both the presentation of DCS and its response to treatment can be idiosyncratic. A full resolution of DCS symptoms can often be achieved with one or sometimes multiple HBO treatments. In some cases, however, resolution will be incomplete, even after many treatments. The normal clinical approach is to continue the treatments until no further improvement is seen in the patient's symptoms. Modest residual symptoms will then often resolve slowly, after the treatment series is ended. Full resolution of symptoms can sometimes take months to achieve and in some instances may never be realized.